The ground-breaking Safe2Say Something Program is now in effect as part of Act 44 of 2018. Pennsylvania is the first to enact a statewide threat system that provides methods of anonymous reporting concerning unsafe activities in schools. 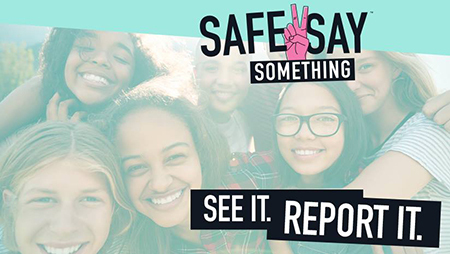 "Safe2Say" features a mobile app (Safe2Say Something PA), website and hotline (1-855-5-SAYNOW) to make anonymous reports of students and others showing signs they have the potential to carry out school violence. Hotline tips go to specially-trained agents for analysis and possible referral to both school and police officials in the community where they arose. Attorney General Josh Shapiro endorses the system but offers the reminder that direct threats to hurt others or themselves should be reported with an immediate 911 call, rather than a report to the new hotline. The hotline is reserved for situations such as bullying, talking about violence, or showing signs of being depressed or otherwise needing help. More information is available at www.saysomething.net. The form and answers to frequently asked questions can be found by clicking here. 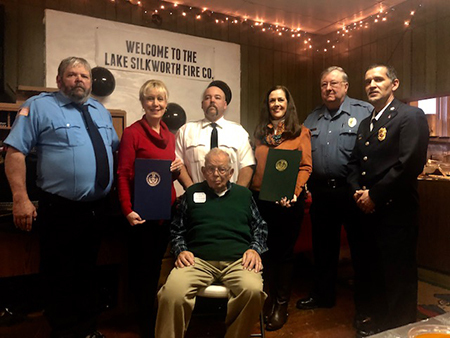 Last weekend, Sen. Lisa Baker and I joined members of the Lake Silkworth Volunteer Fire Department to present legislative citations to Donald Kivler in recognition of his 90th birthday. Donald was also recognized for 53 years of dedicated service with the fire department. Women across the country are encouraged to wear red, as part of the “Go Red for Women” campaign to raise awareness of women’s heart disease. Legislative efforts over the years, including a resolution currently being prepared for this year, have made the official designation in Pennsylvania as a way to remind women of the risks of heart disease. 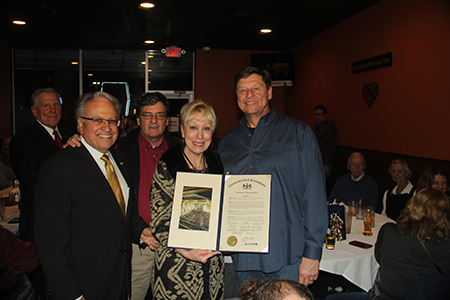 Last week, I joined several members of the Northeast Delegation to celebrate George Roberts’ retirement after many years of service as PennDOT’s District 4 engineer.